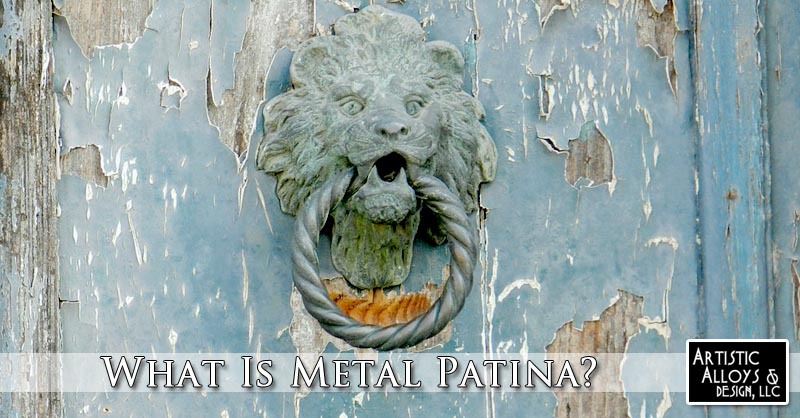 Patina can be a confusing term as it has become an industry catchphrase for metalworking and applies to other industries like furniture. New products are being sold with “patina finishes” all the time and it makes it hard for consumers to know exactly what patina means. Patina is a general term that refers to the appearance of use or age. It can apply to metal, clothing, furniture and more. In metalworking it specifically refers to a chemical process that is caused by exposing metal to the elements. Some types of oxidation give metal a rich and antique look when cared for properly. Time and weather eventually cause copper to have the antique look but can also lead to rust. In metalwork patina is what metal does without being maintained or cared for as it shows its age. Many homeowners who are remodeling or building new want to have range hoods, entry doors, and other elements in their home to have a weathered and look which is rich with patina. This is done with help from ornamental metalworking experts who use chemicals to speed the patina process along. Every type of metal reacts differently to chemicals and needs to be applied by experienced craftsmen. The time a chemical stays on is pivotal in how the patina will look. That means that knowing when and how to stop the chemical reaction is absolutely critical in capturing the perfect patina and not running the metal. Nature and time create their own patina on metal but manmade patina finishes are an art form. Doing it right makes it look like a new item has rich history, doing it wrong ruins the metal. Avoiding patina application that looks too mechanical and ensuring it has an organic look is the trademark of highly trained metalwork artists. What Metals Can Have Patina? Specialty metals that are common in custom metal fabrication can be treated with a patina process. That means that copper, pewter, brass, bronze, zinc and even stainless steel can be given a patina look. While all of these metals can be customized with a patina finish mild steel can give some of the most visually stunning results. While mild steel is considered imperfect for many applications it is one of the best metals for producing the most interesting patina finishes. While some metalworkers choose to use paint to make things appear to have the weathered full of character look, it doesn’t compare. Paint will always be simply on the surface of the metal, while true patina has texture and life. True metal patina also plays with and reacts to light as you move around the object. Painted on “patina” does not have the life, glow, or authenticity of true metal patina. If you live in one of the cities in the Phoenix Valley and want to have some custom metal work done Artistic Alloys & Design can craft any metal item you want. From custom entry doors to range hoods or stair railings we have precisely what Arizona businesses and homeowners are looking for when it comes to quality, durability, and unmatched artistic design capacity. Let us impress with our wealth of knowledge and design ability to create virtually any style you want for your commercial or residential property.